She was pretty excited when she started and picked out a few recipes to try that very week. I think now we need to get her a new crock pot as most of the recipes are made in the 3.5 quart crock pot which probably caused her cooking times were off. She decided to go with the Double Duty Pork Tenderloin dinner. She would be able to cook two pork Tenderloin at the same time, but each flavored differently. Sounds good to me too. Using Reynolds Slow Cooker Liners, was the trick. Both stay in perfectly, I was not sure how she would pull this off. Due to the size of her crock pot, it was overcooked but my dad liked it and she had one more homecooked meal for the week. Cooking for a family of five can be tedious but at the same time at least you feel the need to feed several hungry mouths. Feeding just two adults can also be tedious and since my dad does not love leftovers it is hard to make the portions correct. I hope they continue to find some great recipes and will definitely be looking into sending her a smaller crock pot. 1. 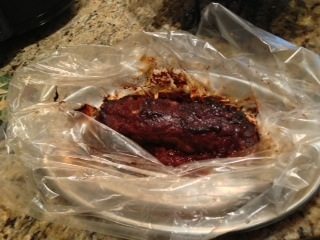 Place pork tenderloin in the bottom of a slow cooker liner bag. 2. Sprinkle liberally with salt and pepper. 3. Stir together the honey, soy sauce, basil, garlic, and olive oil in a small bowl. Pour over tenderloin, sprinkle with Parmesan cheese, and set aside. Here’s a classic barbecue preparation. If pressed for time, just coat the tenderloin in your favorite barbecue sauce. 3. Stir together the ketchup, brown sugar, vinegar, Dijon mustard, soy sauce, chili powder, garlic, and onion powder in a small bowl. 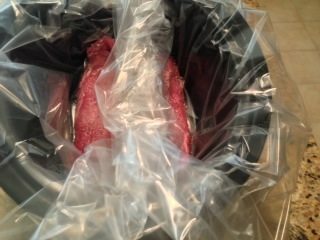 Pour over tenderloin, and set aside. 1. 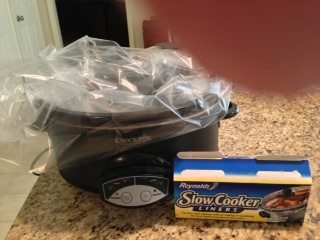 Place both liner bags, side by side, into the slow cooker. Drape each liner (closed) away from the other, extending over the sides of the slow cooker. 3. Move two large, shallow serving dishes or bowls next to the slow cooker. Remove cover and using pot holders or oven mitts, carefully remove each liner and its contents to its own serving bowl. Let the liner rest open and allow contents to cool slightly. Remove the tenderloin from the liner using tongs, and transfer to the serving bowl. Then grasp the bag, holding the top, and cut a corner off the bottom of the bag, large enough to allow the remaining contents of the bag to be released over the pork and into the bowl. Discard the liner. Repeat with the other dinner. 4. Allow the dinner not being served to cool, and package in a resealable plastic freezer bag or freezer container (remember to label it!). 5. Before serving, taste, and season again with salt and pepper. This is a great cookbook for the empty nester or kidless couple. Who would you give this book to? I have just started into using a slow cooker and these recipes look great! Plus, this would make my life simpler if I can have a meal ready to go after we do errands, etc. Thank you for an honest review. That food looks good and I am glad you included the recipes too. This looks so yummy! Will have to try it. I love slow cooking for me and my mom. What great recipes here. Thank you for sharing them. Wow. Looks superb. How am I waiting for this?